Does Soy Protein Interfere with Iron Absorption? The body absorbs only a limited amount of iron from foods and supplements. We absorb a higher percentage of heme iron, found in meat proteins, than we do nonheme iron, found in plant-based foods, and a variety of food components, including phytates and proteins found in soy, may inhibit nonheme iron absorption. If you have iron deficiency or are at high risk of developing iron deficiency, you should avoid eating nonheme iron sources with soy protein. In a 1992 study published in the "American Journal of Clinical Nutrition," Swiss researchers found that human subjects absorbed significantly more iron from soy protein when the phytic acid content of the protein was reduced to less than 0.01 mg/g. Even after all phytic acid was removed, however, subjects still absorbed less iron from soy protein than from egg white. The researchers concluded that other factors in addition to phytate contribute to poor bioavailability of iron from soy protein. In a 1994 study published in the "American Journal of Clinical Nutrition," researchers from the University of Kansas Medical Center found that unmodified soybean-protein isolate significantly inhibited iron absorption in 34 human subjects. 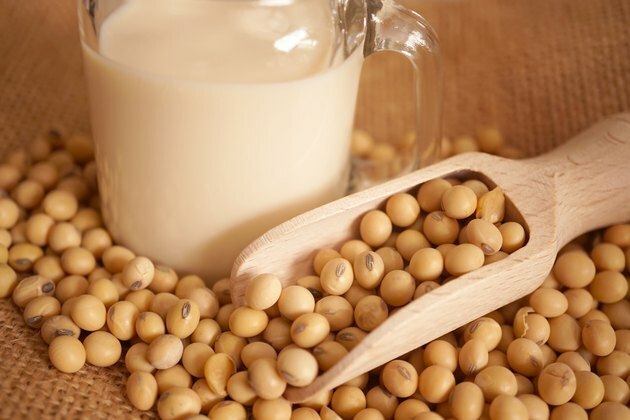 The researchers found that soybean protein contains two iron absorption inhibitors, including phytic acid and a functional group that makes up part of the protein conglycinin. Foods that contain soy protein include tofu, soybeans, tempeh, bean curd, soy milk and many dietary supplements. The Harvard School of Public Health recommends limiting your weekly soy intake to two to four servings, because insufficient research exists to prove that eating high amounts of soy does not cause harm. Other food components that can hinder nonheme iron absorption include tannins in black and green tea, calcium in milk and dairy products, phytates in legumes and whole grains and polyphenols. On the other hand, vitamin C found in citrus fruits and other fruits and vegetables may boost iron absorption.